On May 15, 2017, Japan Aerospace Exploration Agency (JAXA) and the European Space Agency (ESA) held the Inter-Agency Meeting to strengthen and deepen the bilateral cooperation, on the occasion of Prof. Dr. Johann-Dietrich Woerner’s first visit to Japan as the Director General of ESA. JAXA and ESA announced the joint statement concerning the result of the meeting and the establishment of the joint working groups in the mutually spefified areas, at the joint press conference after the meeting. The Heads of the two agencies presented reports on ESA and JAXA space activities and reviewed the results of the cooperation between the two agencies that has been carried out over many years. They confirmed that significant results have been achieved through cooperation in the International Space Station program, as well as in joint missions in fields such as Earth observation, space science and space environment utilization. On-going joint missions such as EarthCARE, an atmospheric observation mission measuring the structure of clouds, aerosols and radiation that aims to contribute to efforts to tackle climate change issues, and BepiColombo, a Mercury exploration mission to study the origin and evolution of the least explored planet in the inner Solar System, are progressing according to plan. Both Heads confirmed that these missions will bring significant benefits to the two agencies and to the international scientific community. The Heads of the two agencies recognized the importance of global satellite observation and other space applications, which contribute to the betterment of society and to pursuing the Sustainable Development Goals (SDGs), and agreed to deepen bilateral collaboration in these fields. In particular, the two Heads agreed to promote the usage of satellite data to improve the accuracy of the Green House Gasses inventory report, which contributes to measures being taken against global warming, as well as to promote the integrated applications of space-based technologies, leading to the expansion of new enterprise in many fields. The two Heads recognized the significance of optimizing the utilization of the ISS until 2024 through international partnership, and agreed to consider the creation of joint missions in the field of space exploration that would leverage the strengths of both Japan and Europe, including Moon exploration. In addition, both agency Heads agreed to cooperate to ensure the success of the 2nd International Space Exploration Forum (ISEF 2), a Ministerial-level meeting which is to be held in Japan on 3 March 2018. In conclusion, the Heads of both agencies established joint Executive level ESA-JAXA working groups in the fields specified above to ensure that discussions are concluded by the end of this year. 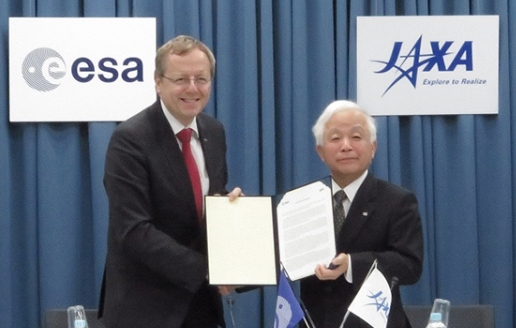 The two Heads committed to contributing to solving societal challenges, promoting industry, and expanding the scope of human activities using space technology through all bilateral cooperation between ESA and JAXA.